Another 12 meters Pipe rolling machine ready for delivery. Come to Faccin to see the Giant! Pipes production technology is an area of such complexity that only companies with many years of experience and high technology background can safely and reliably work in and deliver machines suitable for the most challenging projects. Faccin S.p.A. has many years of experience in the design and manufacturing of special machines, standard and customized, for the production of pipelines. 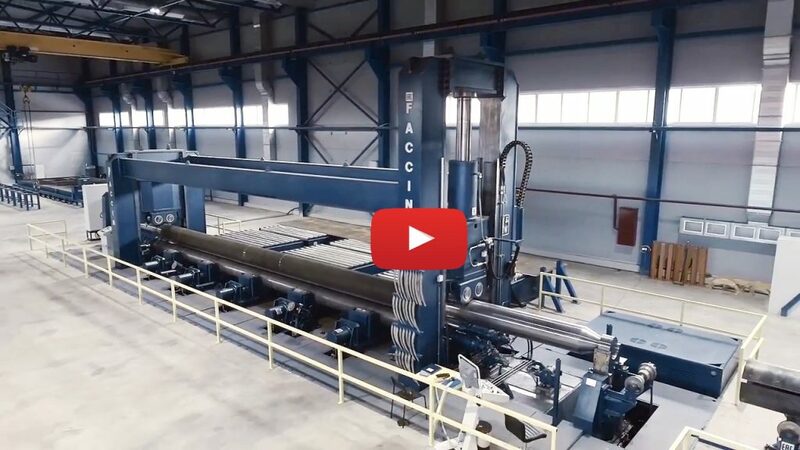 In order to meet specific production requirements, Faccin has just finished another HAV-2P for a major worldwide player: a NC-controlled high-performance pipe mill bending rolls ideal for the production of pipes delivering productivity, repeatability and automation of the entire process. These pipes production bending rolls are constructed with extremely sturdy electro-welded structures and are fitted with three rolls with special anti-deflection system electronically controlled. HAV-2P long bending rolls are designed for rolling plates generally from 5 to 45 mm thick, ideal for producing pipes up to 18m long and diameters from 15in to over 60in, complying with technical specifications, tolerances and quality of the API standards. For further increase the production speed and automation, Faccin proposes in addition to the HAV-2P pipe mill bending roll, an accurate post-bending machine that prepares the pipe for welding and a series of outboard motorized guide rollers that control the movement of the pipe from the HAV-2P to the post-bending machine and successive working stations. Please, do not miss the opportunity to BOOK A FACTORY VISIT in the month of March to see this giant and learn about our technology for pipelines production!